Drift is the mantle of detrital material deposited directly or indirectly through the agency of extensive glaciers. at Purington station on the Chicago, Rock Island and Pacific Railway. Apart from these exposures, temporary exposures are frequently seen at various points in the city where excavations are being made for the foundations of buildings, water pipes, etc. In the country districts exposures are frequent along the road cuts and streams. An examination of the drift at these exposures shows that while stratified deposits of sands, gravels, and clays are of frequent occurrence, the drift as a whole is unassorted. It consists generally of a matrix of bluish clay in which is embedded rock material of all shapes, sizes, and lithologic characters (fig. 17). The clay is highly calcareous and is evidently largely the result of abrasion of beds of limestone and calcareous shale. The stony material embedded in this clay matrix ranges in size from fine gravel to bowlders several tons in weight. For the most part these pieces of rock are less than 1 foot in diameter, but frequently bowlders 2 to 3 feet in diameter occur, and rarely blocks 5 to 10 feet in diameter are seen. These bowlders are of such size that they could not be transported by water currents of ordinary strength unless they were frozen in floating blocks of ice. The arrangement of the drift is most heterogenous, fine and coarse, clay and stones being intimately mixed. This is in striking contrast with the assorted and stratified beds of water deposited material. Yet, from the frequent occurrence of stratified beds at some points, it is evident that considerable water must have aided in the deposition. The shape of the pebbles and bowlders of the unstratified drift is not that of streams or shore pebbles. Instead of smoothly rounded forms, the pebbles and bowlders of the drift are partly angular and partly somewhat rounded, but largely subangular with numerous flat faces, or facets. The facets usually show polishing, parallel grooving, and scratching, or though smoothed and striated while being held firmly in one position and moved over a hard surface (fig. 18). When the surface of the rock underlying the drift is examined and compared with that under other coverings, significant phenomena are also noted. In a region where the soil is residuary - i.e., derived directly from the disintegration of the rock - there is a gradation downward from the loose soil to partially disintegrated rock, and this shows less and less decomposition until finally rock of the original hardness is reached below the zone of weathering. Most rock is more or less variable in composition and texture, and consequently some parts yield more readily to the agents of disintegration than others, and differential weathering results, in which the more resistant parts remain, while the less resistant disintegrate into soils. Hence a weathered rock surface is uneven, discolored, and pitted with irregular cavities. It is often difficult to say where the soil ends and the rock begins (fig. 4). This, however, is not the character of the rock surface where exposed by the removal of drift. Here the line between the drift above and the rock beneath is sharp (fig. 5). Unless the upper rock beds be thin and shelving it is usual to find a smoothed and polished surface marked with parallel grooves and scratches, similar to those upon the pebbles and bowlders of the drift. If the rock surface has not been long exposed the striations are usually sharp and distinct. Sometimes they are continuous for several yards. usually they are shorter. They are sometimes almost perfectly straight, sometimes curved, broken, or jagged. They are usually nearly parallel at any given place, or they cross at low angles. It is also found that where there are slight inequalities of the surface, as protruding knobs or jutting ledges, one side - in this district the east and northeast - is smoothed, polished, and scratched, while the opposite side is rougher and more or less unmodified. With small, sharp depressions the east and northeast sides are rough, while the west and southwest sides have been smoothed. 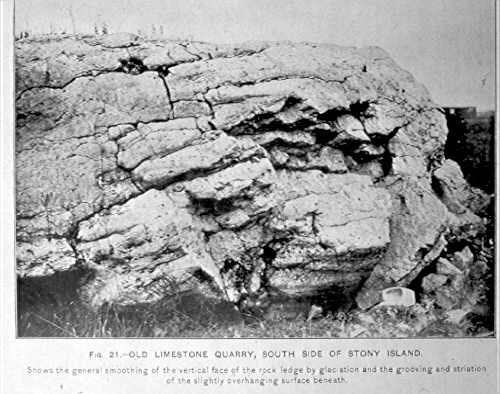 These different phenomena are will exhibited by the rock surface at Stony Island. These various phenomena give indisputable evidence that these features are not the results of weathering or of water erosion, but that over the rock surfaced has moved some great mass with abrasive material at its bottom, smoothing, polishing, and scratching as it went; that this body was more or less plastic in its nature, so that it conformed in a measure to the inequalities of the rock bed, and that the movement was in the direction of the striations and against the abraded sides of surface inequalities. The fine and coarse material of the drift overlying the rock would furnish the abrasive material, the polishing powder, and the graving tools to a moving mass of the right kind. These various phenomena of the drift and the underlying rock surface give unmistakable evidence of the agency which produced them. The drift is identical in kind with the deposits now being made by glaciers in varous parts of the world (see fig. 19 and compare fig. 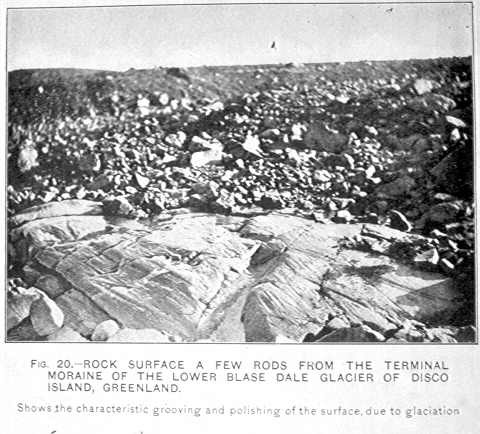 17), and the characteristics of the surface of the rock beneath the drift are identical with those of the surface of the rock over which glacier ice is known to have recently passed (fig. 20). Hence it is evident that the drift is really a glacial deposit. While the clay matrix of the drift is highly calcarous, showing that it was derived very largely from limestones such as immediately underlie it in this are, examination with a microscope shows a considerable percentage of grains of a great variety of minerals such as would result from the abrasion of crystaline rocks. Also, if the coarser material, the pebbles and bowlders of the drift, be examined, it is found that about 90 percent corresponds in character to the underlying rock strata, while the rmaining 10 percent consists of sandstone and crystalline rocks of many kinds wholly foreign to Illinois. In some parts of the district surface bowlders are more of less numerous. Of these bowlders more than 95 percent are derived from crystalline rocks foreign to this region. The direction of movement of glaciers is shown by scratches or striations on the rocks, called striae. 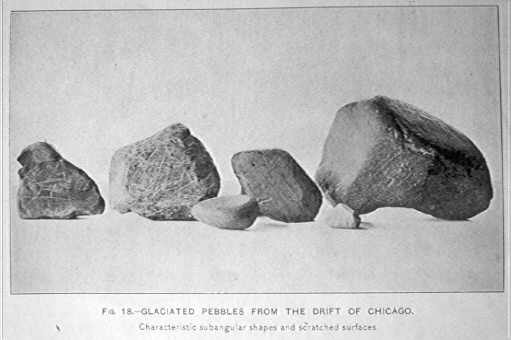 It is evident from the glacial striae about Chicago and at other localities that the glacier came from the north, moved up the basin of Lake Michigan, and spread out over the surrounding areas. Retracing the course of this movement, it is found that not within 300 miles are formations known to occur from which the foreign rock constituents of the drift could have been derived. the sandstones and crystalline rocks occur about the eastern part of Lake Superior, northern Lake Huron, and nrothward. It is thus apparent that the glacier depositing the drift of Cook, Dupage, and Will counties was no local phenomenon. As has already been indicated, the drift not only covers most of the State of Illinois, but also extends over a large part of northern United States and Canada, everywhere showing phenomena similar to those of this vicinity. Such data, studied over a wide range of territory and under greatly varying conditions, show that there came about climatic changes the like of which had never before occurred in this latitude in all the earth's history. This great change was the development of arctic conditions over all the northern part of North America and southward into the United States to the latitude of southern Illinois, i.e., below 38 degrees north latitude. In consequence of these arctic conditions, a vast continental ice sheet, comparable to that of Greenland, but many times larger, came into existence in the northern part of the continent over the area now covered by the drift (fig. 6). It was to this great continental ice sheet that the Michigan glacier, which deposited the drift in this region, belonged. The cause of this development of arctic conditions in low latitudes has been variously attribued to changes in the elevation of glaciated territory, to changes in the earth's orbit, to changes in the constitution of the atmosphere, and to a combination of causes. It is sufficient here to note that the cause is not known. Whatever the cause, the fact that a great ice sheet, almost 4 million square miles in area, came into existence in the northern part of the continent is no longer open to question. The proof is found in the character of the drift, in its relations, and in the pculiar and distinctive features of the rock surface beneath. It may be well to recall the conditions under which glaciers and ice sheets develop. With an annual temperature such that the summer heat does not fully melt the winter snows, a certain portion of the snow remains over to the following winter. If these conditions prevail for several seasons the quantity of snow remaining gradually increases. If the continuance be long enough the snow field may reach great thickness and extend over vast areas. With this increase in the depth of the snow the lower parts become gradually compacted by the weight of the overlying mass, by downward percolation and refreezing of water from the snows melted at the surface, and by internal changes. Thus the lower part of the mass becomes ice while the top is yet loose snow. If the accumulation of snow continues for many decades or many centuries, the ice may become hundreds or even thousands of feet thick. While ice thus formed is generally regarded as a brittle solid, yet, as is well known, it behaves much like a plastic substance, and under favorable conditions will creep or flow over a land surface. It is not intended to assert that ice really flows; the mechanics of the motion are not yet demonstrated. However, when accumulated in such mass as a great snow field would furnish, it spreads in all directions from the highest part much as though it were a very stiff liquid, and for convenience the ice may be said to flow. Motion thus brought about is glacier motion, and ice thus moving is glacier ice. Thus the glacier of a high mountain vallye moves down the slope; and thus the ice of a great continental ice sheet moves outward from its hightes part, its center of accumulation, and may spread over vast areas of the surrounding territory. Greenland affords an example of the conditions which prevailed over the northern part of North America during the Pleistocene period. A large part of the half million square miles which Greenland is estimated to contain is covered by a vast sheet of snow and ice, hundreds and perhaps thousands of feet in thickness. In this field of snow and ice there is continuous though very slow movement. The ice creeps out in all directions from the interior until it reaches the sea, where great masses become detached and float away as icebergs, or until it reaches territory where the climate is such as to waste the ice by melting and evaporation as rapidly as it advances. 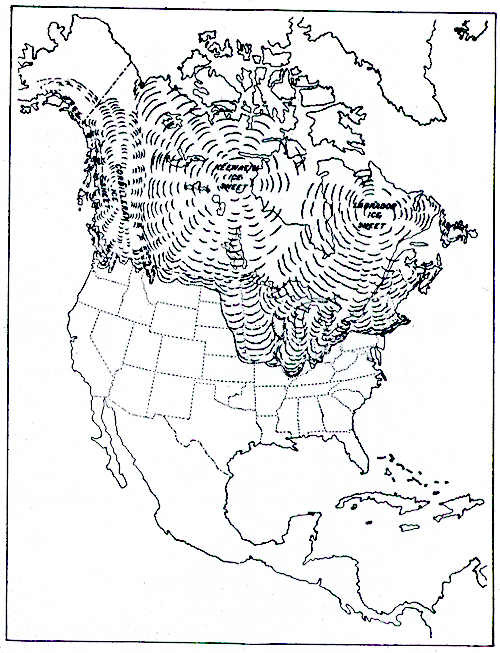 Caption: Map of area covered by the North American ice sheet of the Glacial epoch at its maximum extension, showing the approximate southern limit of glaciation, the three main centers of ice accumulation, and the driftless area within the border of the glaciated region. The great North American ice sheets of the drift epoch appear to have had more than one center of growth. One main center lay east of Hudson Bay, and another west of it (fig. 6). There were perhaps other minor centers; but ultimately the snow fields, extending themselves from their various centers, united, and the resulting ice sheet is commonly spoken of as a unit. Other smaller ice caps occurred in the west and northwest, but it is with the ice of the main sheet we have here to do. From these centers the ice spread southward over the area now covered by the drift. So long as the rate of accumulation exceeded the rate of waste by melting and evaporation at the edge of the ice sheet, the glacier continued to advance; but when a region was reached where the rate of waste equaled the rate of advance, the margin halted. Where the waste exceeded the advance, the margin retreated. Periodically there seem to have been great oscillations; these were so notable in their extent and in their effects as to be designated stages of teh Pleistocene period. During the glacial stages the conditions of glaciation so prevailed that the ice advanced far southward, driving the plants and animals before it, destroying and burying in drift those which could not move, and introduced a fauna and flora of the higher latitudes. During the interglacial stages a reversal of conditions took place. The climate became so much milder that the ice was melted back far northward, a new soil was developed, and plants and animals returned to their former habitats. A return of the arctic conditions caused a readvance of the ice and the deposit of a new sheet of drift, burying the soil and the organic remains. A careful study of these buried soils and organic remains has led many students of glacial phenomena in America to a belief that the Pleistocene period comprised a series of these glacial and interglacial stages. Chamberlin and Leverett have given the following provisional outline of the sucession of drift sheets of North America formed by the several advances of the great ice sheets, with the intervening soil horizons which mark the stages of recession or deglaciation. The names have been taken from the regions of maximum extension of the ice and from places where the phenomena are best seen. The more extensive of these advances reached southern Illinois and northeastern Kansas, to the limit of glaciation indicated in fig. 6, a distance of over 600 miles from the northern boundary of the United States. It is probable that the ice of several of these advances passed over northeastern Illinois, but so thoroughly are the deposits intermingled in this area, that it has not yet been possible to distinguish the work of the several glaciers. In this discussion of the glacial features of the Chicago district the phenomena are treated as the work of glaciation in general or as the work of the last glacier which advanced to the head of the Michigan Basin. Drift sheets and intervening soil horizons of North America. 11. Late Wisconsin drift sheets. 10. Fifth interval of recession, shown by shifting of the ice lobes. 9. Early Wisconsin drift sheets. 8. Peorian soil and weathered zone -- Toronto formation; fourth interval of recession or deglaciation. 7. Iowan drift sheet and main loess deposit. 6. Sangamon soil and weathered zone; third interval of recession or deglaciation. 4. Yarmouth soil and weathered zone and Buchanan gravels; second interval of recession or deglaciation. 3. Kansan drift sheet (of Iowan geologists). 2. Aftonian gravel and soil deposit; first interval of recession or deglaciation. 1. Sub-Aftonian drift sheet (old Kansan of Chamberlin). If the varying thickness of the drift in the region about Chicago, as shown by means of well borings, be considered, it is readily seen that the topography of the area would be quite different if this unconsolidated material were stripped off the rock surface. Instead of the very flat plain on which Chicago now stands there would be an undulating erosion topography. The present rock outcrops, where the drift is thin or absent, would be the tops of hills rising above their surroundings, where the drift is now thick. Some of these undulations have a relief of more than 100 feet. The figures on the economic geology sheet indicate the thickness of the drift at various points. If this thickness be deducted from the surface elevation at the place of boring, the elevation of the rock surface is determined. 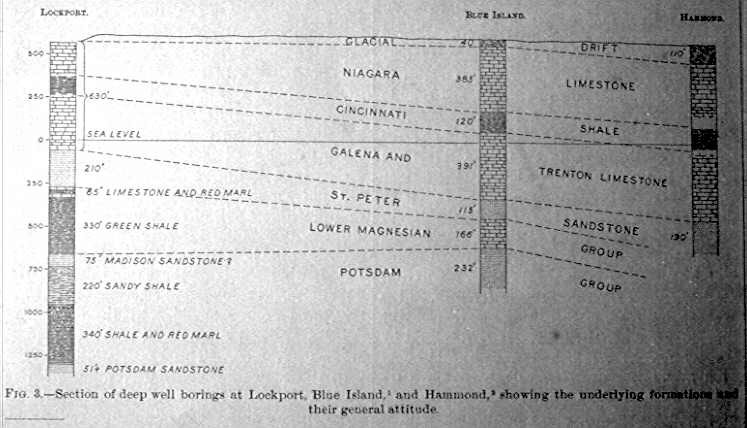 Mr. Samuel J. Artingstall, while city engineer, prepared a map of Chicago giving the elevation of the rock surface at many points as shown by borings. The data for this map were insufficient to determine the full details of the topography of the rock, but they showed clearly the very uneven character of its surface and the consequent varying thickness of the drift. The lowest level of the rock as shown by this map is near [the] North Branch of [the] Chicago River, about one-half mile north of its junction with [the] South Branch. The rock here is 124 feet below the level of Lake Michigan. Passing out radially from this point, the surface rises with many undulations and numerous exposures. This rise is continued under the moraine surrounding the Chicago Plain. The highest elevation of the rock surface in this area which has come to the writer's notice is in the town of Frankfort, Will County. The rock here reached at a level 150 to 160 feet above Lake Michigan. A profile of the lake basin from Racine, Wis., to Holland, Mich., shows the bed of the lake to reach sea level; thence southward to the head of the lake the depth decreases more or less regularly. The thickness of the drift over the rock beds beneath the lake is unknown; but, neglecting this, it is evident that there is a rise in the rock surface along the basin from the latitude of Racine to the crest of the moraine in Will County, Ill., of at least 740 feet. In the last glacial stage the Michigan glacier advanced southward along the Lake Michigan trough and in the region of Chicago spread out at least 20 or 30 miles beyond the present limits of the lake. At just what period this great lake basin was formed is not known, but the origin is believed to have been prior to the last glacial epoch. A summary of opinions as to the time and mode of origin of the Great Lake basins is given by Alexander Winhall in Am. Geologist, Vol. 19, 1897. As shown by the striations upon the rock surface at the various exposures in Cook County and eastern Dupage County, the movement of the ice over the area was in a generall northeast-southwest direction. Here, then, the bottom of the ice must have moved up a slope of considerable height, if the relative elevations of the rock surface just given were then as they are now, and must have traversed an area marked by considerable inequalities of surface; yet the direction of flow does not seem to have been materially affected by any of these conditions. The direction of flow of a liquid substance does not depend immediately on the slope of its bed, but on the slope of its upper surface; so also glacier ice, while not flowing precisely as does a liquid, has a motion which is clearly controlled by gravitation, and the resultant movement is much the same. For the surface of the ice to have had sufficient slope to cause the movement of its bottom up this rock slope beneath the Chicago district and over the highest rock elevations of Dupage and Will counties, the thickness over the lake area must have been great. Over the site of Chicago the ice must have been at least several hundred feet thick. Over the deepest part of the lake basin the ice was probably a few thousand feet thick. What the elevation of the land and the thickness of the ice at the centers of accumulation at the north must have been to have sent off this glacier 800 miles or more southward can be estimated only with a large measure of uncertainty. As already stated, it is probable that the glaciers of several different stages traversed the area of northeastern Illinois, but the work of the earlier ice sheets can not be distinguished, so that this discussion refers chiefly to the work of glaciation in general. At the opening of the Pleistocene period the upper rock beds had largely disintegrated into soils and were readily broken up by any disturbance. Exposed surfaces were cavernous and irregular, from the weathering out of soft parts, the more resistant parts being left. In the soils doubtless grew a prolific vegetation. The drainage systems were probably well developed and the whole district was cut up into hills and valleys. This uneveness of the rock surface beneath the Chicago Plain has already been noted. Not so many data have been collected in the surrounding morainal tract, but doubtless the rock surface there is much the same. The present rock topography is probably rather more subdued than that which the first ice sheet was forced to override, for the general effect of glaciation was to reduce its minor inequalities. Where there are now gentle undulations of the rock surface there may then have been sharp ravines and hills, and where there are rounded hilltops beneath the drift there may have been more or less craggy bluffs. Where there were soils, disintegrating rock, and cavernous strata, there is now a fresh rock surface, hard, smooth, polished, and scratched; and on this rock surface is the thick mantle of drift. This change is the result of the work of glaciers. When the glacier first invaded the region and advanced over the surface which had been cut up by erosion and whose upper rock beds were disintegrating into soils, while its hills and valleys were mantled with vegetation, if found much material ready to be incorporated in its lower part; and hence all along its course the glacier loaded itself with debris of all sorts. Most of this was carried in the lower part of the ice sheet as subglacial drift, but some was carried higher up. 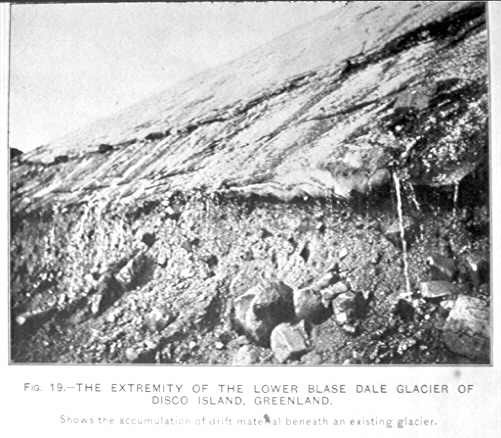 Where ledges, hills, or prominences of any kind stood in the path of the glacier, they were surrounded or overridden by the icy flood, and from their slopes and summits debris appears to have been carried away and incorporated in the ice at levels corresponding to those of the places of derivation, thus becoming englacial drift. If the obstructing hill was high enough to extend above the ice sheet, such debris might be dislodged and fall upon the surface of the surrounding ice, when it would be borne away as superglacial drift. This loading of the glaicer and the weight of the ice itself make it a tool of great power. The pressure for a depth of 100 feet of ice is about 40 pounds to the square inch. Thus beneath a glacier hundreds or thousands of feet in thickness the force with which the rock fragments at its base are applied as abrasive material to the surface upon which the ice rests is well-nigh resistless. When the loose material was removed the solid rock was exposed to wear, and the advancing ice ground down its surface and smoothed, polished, scratched, and grooved it with the earthy matter and rock fragments which it slowly but steadily carried forward. At the same time the rock fragments in the ice were themselves ground, striated, and polished (see fig. 18). While held firmly against the rock bed by the moving matrix of ice, one side of a pebble would be ground flat, polished, and striated. On encountering a resisting obstacle the pebble would be turned into a new position, refrozen into the matrix, and a new face developed as before. Where a prominence of rock obstructed the ice movement, it was pressed upon with great force and the continued advance of the rock-shod ice wore away the irregularities of the surface, and, if it did not entirely grind away the prominence, gave to it a smoothed and rounded contour. The sides facing the ice movement -- the stoss sides -- were most subjected to wear. The lee sides, being more protected, might retain some of their former irregularities. The minor inequalities of the rock surface would be treated in like manner, and, if not entirely obliterated, would give evidence as to the direction of ice movement. The excavation for the Fullerton avenue conduit, in the northern part of Chicago, showed striae with bearing S. 60 degrees west. The exact location is not noted on the map. At the quarry near the corner of Chicago and Western avenues, 1 mile southeast of Humboldt Park, a few faint striae have a bearing S. 72 degrees W.
At Eighteenth and Robey streets, about a mile east of Douglas Park, the arching layers are glaciated, showing striae whose bearing ranges from S. 52 degrees W. to S. 57 degrees W.
At the Hawthorne quarry, on the Chicago, Burlington and Quincy Railway, there are two sets of rather heavy scorings. The earlier set follows approximately the strike of the dipping layers, bearing S. 60 degrees W. to S. 64 degrees W. The later set crosses the upturned edges of the layers at a slight angle, bearing S. 52 degrees W. to S. 54 degrees W.
At Stony Island, 1 mile north of Lake Calumet, there is probably the best exhibition of glaciation to be seen in the vicinity. 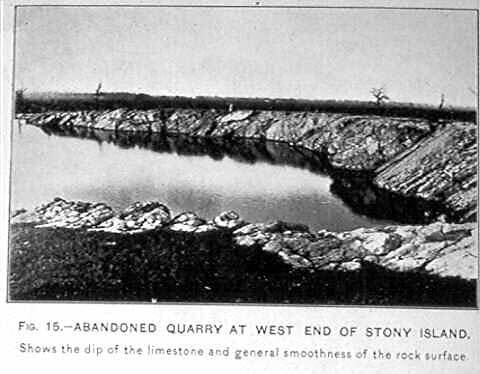 At the old quarry at Ninety-second street and Stony Island avenue, on the north side of the elevation, the strata dip toward the northwest at an angle of 42 to 45 degrees. The whole rock surface of the upturned edges of strata has been planed off smooth (fig. 15) and shows, in places, striae which have a bearing S. 19 degrees W. to S. 28 degrees W.
At the quarry on the south side of the ridge, where the strata dip toward the southeast at angles of 32 to 33 degrees, the upturned edges have been truncated, smoothed, and striated. There are here some heavy groovings nearly in the line of strike,w ith fine striations having directions varying from S. 45 degrees W. to S. 49 degrees W. One of the most notable phenomena here is an escarpment of the dipping layers, rising about 6 feet above the remainder of the quarry. This is not only smoothed and striated upon its surface and nearly vertical front, but also, beneath one of the lower layers, its dipping under surface is smoothly polished for about 18 inches back from the front of the ledge (fig. 21). This indicates well the quasi-plastic nature of the overriding body which did the striating and polishing and at the same time accomodated itself to the inequalities of the surface over which it moved. At the quarries 1 mile southwest of Blue Island a few faint striae were observed with the bearing S. 54 degrees W.
At Thornton, on the Chicago and Western Indiana Railroad, the rock in the bed of Thorn Creek, a short distance south of the village bridge, shows a smoothed surface with striae having bearings S. 23 degrees W. to S. 27 degrees W.
At the quarry 1 mile west of Elmhurst, on the Chicago and Northwestern Railway, the rock surface shows small grooves and fine striae with a direction of S. 20 degrees W. At one point the striae are seen to be deflected 26 degrees from parallel about a small prominence not more than 6 inches in diameter. Three miles southeast from Elmhurst, near the Illinois Central Railroad, the rock exposure shows distinct groovings and abundant striae with bearings S. 64 degrees W.
The planed rock surface exposed a few years ago on the site of the Lagrange Waterworks showed scattering striae bearing S. 58 degrees W.
At Mr. Schultz's quarry at Lyons, the newly stripped surfaces show striae ranging in direction from S. 87 to S. 94 W.
In the bed of the Desplaines River, about one-quarter of a mile north of the Santa Fe Railway bridge, is a heavily glaciated surface of several square rods exposed at low water. Small grooves and fine striae are numerous with the bearings S. 89 degrees W.
At the quarry near McCook station, on the Santa Fe Railway, are seen striae showing directions S. 41 degrees W.
In the bed of the Sanitary and Ship Canal of Chicago near Willow Springs, were seen faint striae bearing S. 23 degrees W. As noted before, Mr. Leverett considers the heavy groovings reported by Mr. Ossian Guthrie as exposed in the excavation of the diversion channel for [the] Desplaines River, with a bearing of about S. 60 degrees W., to be the product of river erosion rather than glacial striae. As the advance of the ice continued, more or less of the subglacial drift was constantly lodging and being left behind. So also on the surface and at the margins of the ice sheet, such material as was there embedded in the ice was constantly being released by melting and separation. Some of this englacial and superglacial drift descended directly to the base of the ice about the margins and through crevasses and moulins and some was only lowered with the melting surface and carried on to be dropped later. So long as the rate of wasting was less than the rate of advance the ice front moved forward, and this freed material was overridden and commingled and spread out beneath the ice as the ground moraine. In the continental ice sheets the advance continued for long periods and the glaciers traversed vast areas, spreading out the drift in the extensive sheets now found. When the rate of wasting so nearly equaled the rate of advance as to cause the ice front to halt for any considerable time, there was made a greater deposit of drift; because, though the front of the glacier halted, the ice itself continued to advance and bring up drift to be deposited at the melting front. Such deposition also took place beneath the thinned melting edge of the ice sheet. If this halt continued for some time, or if the ice front oscillated back and forth over a narrow area, a more or less ridge-like belt of thickened drift -- i.e., a border moraine or terminal moraine -- resulted. When the rate of wasting gained the ascendency over the rate of advance, either form the increase in the wasting or from the decrease in the advance or from both causes, the ice front retreated, and during the retreat all the drift embedded in the ice or lying upon its surface was let down upon the deposits already made. The subglacial material thus left, and such of the englacial and superglacial material as could not afterward be distinguished therefrom, would be considered part of the ground moraine. Study of existing glaciers, such as those of Greenland, shows that the great bulk of the drift is carried in the lower layers of the ice, presumably that most recently taken up at the very bottom. Since, as it appears, subglacial drift is constantly becoming lodged and being left behind by the advancing ice, it results that a large part of the drift is deposited within comparatively short distances of the place of derivation. A smaller part, especially that which had become embedded in the ice somewhat above the basal layers, may be carried considerable distances before being deposited. Observers of glacial phenomena report comparately little evidence of upward or downward shifting of debris in the body of the ice, except such descent of englacial and superglacial drift at the melting ice front and down crevasses and mountains as that to which reference has been made. Thus englacial drift whose derivation is such as has been indicated, and which is lodged well up in the body of the glacier, may be carried hundreds of miles before being deposited by the melting of the inclosing ice. Conversely, it may be postulated with a good degree of probability that most of the drift whose place of derivation is at a considerable distance from the place of its final deposition by the ice must have been carried well up in the ice as englacial drift, otherwise it would not have been carried so far before being deposited. Since the englacial drift in any given section of the ice sheet is very much less in amount than the basal drift, it results that an examination of almost any section of the drift in this region shows 80 to 90 per cent of its material to be of very local derivation. It may be from the rock formation that immediately underlies the drift at the place of examination, while 10 to 20 per cent may be from formations 50 to 100, or even several hundred miles back along the route the glacier has traversed. From this arrangement of the drift in the ice sheet it also results that, on the final retreat of the ice front from the area, the englacial material, being highest up in the ice, is left upon the surface. The finer material, being small in amount, is not readily distinguished from the subglacial drift, but the bowlders are largely left upon the surface or partially or wholly embedded in the surficial part of the drift. An examination of these surface bowlders in this region rearely shows as many as 5 per cent which might have been derived from the local sedimentary formations, while 95 per cent or more are of crystalline rocks, with an occasional sandstone whose place of derivation is several hundred miles northward. The greater part of the deposits in this region made thus directly by the ice has been dropped promiscuously. The melting of the ice and the rainfall upon the surface of the glacier, however, undoubtedly gave rise to considerable water, which flowed on the surface and plunged down crevasses, so far as these were found, and also flowed beneath the glacier and issued from the ice front so that a certain part of the drift was assorted and stratified. Within the area here described both ground moraine and terminal moraine are represented. The Chicago Plain occupies the low land of the ground moraine. A broad ridge-like belt comes down from the north and swings around the head of Lake Michigan, inclosing the Chicago Plain. This belt marks the end of the glacier during the later part of the Wisconsin stage and has been called the Valparaiso moraine. The principal difference between the Valparaiso terminal moraine and the ground moraine, as left by the glaicer, was in the surface elevation and in the thickness of the deposit. While there evidently was some difference in the original topography, there was probably not so great a difference as now. The Chicago Plain covers most of the ground-moraine area, and its flatness, in part at least, is of later development, being due to the action of lacustrine waters. The area north of Lagrange, from a line near [the] Desplaines River westward into DuPage County, is apparently unmodified. Here is seen the passage from the ground moraine into the thickened terminal moraine. The change in topography is very gradual, passing from nearly flat to moderately undulating. From a point near Lagrange to Homewood, the present inner margin of the moraine is clearly marked, being coincident with the limits of the Chicago Plain. Southeastward from Homewood a nearly flat till plain intervenes between the limits of the lacustrine plain and the inner margin of the moraine. While the rock surface is higher under the moraine than under the plain, the elevation of the surface of the ground is not entirely due to the rise in the underlying rock surface. Owing to the abrupt local variations in level, any estimate of the average elevation of the rock surface would have little value; but, from a consideration of one hundred borings distributed over the plain, the average elevation of the rock surface is roughly estimated at 46 to 50 feet below the level of Lake Michigan, while from about one hundred borings west, southwest, and south of the city, in the area of higher rolling topography, the average elevation of the rock under the moraine is estimated at 35 feet above the lake. In the plain these borings show the drift to vary from 0 to 130 feet in thickness, with an estimated average of 60 to 70 fet. In the morainic belt the records obtained show the thickness vary from 0 to 160 feet, with an estimate average of 100 feet. The latter average, however is low as compared with estimates made by Mr. Leverett based upon data obtained from a much broader area. Mr. Leverett has estimated that the average thickness of the drift in that part of Illinois covered by deposits of Wisconsin age is 143 to 165 feet. 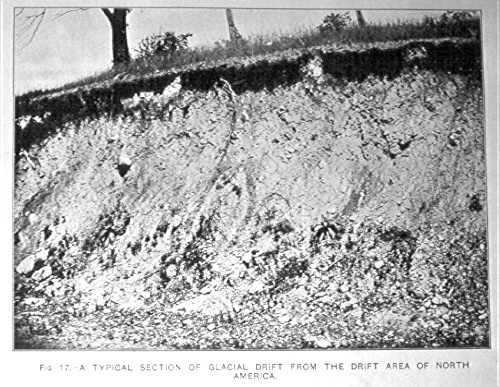 While the belt of higher land about the Chicago Plain is largely due to a rise in the rock surface beneath it, it is also due to a greater thickness in the drift (fig. 3). North of the Chicago Plain, between [the] Desplaines River and the lake, is a series of three gentle ridges of drift parallel to one another and nearly parallel to the lake shore. Mr. Leverett describes these as a lake border morainic system. It is probable that they mark slight stages of halt in the recession of the ice front. Only the western of these ridges extends into the area here described. The southern 5 or 6 miles of its length is seen east of [the] Desplaines River in the towns of Norwood Park and Jefferson Park, gradually decreasing in strength and dying out near Mont Clare, on the Chicago, Milwaukee and St. Paul Railway. In this part is has a relief of 20 to 30 feet above the plain to the east. Its surface is very gently undulating. The middle ridge does not enter the area, but Mr. Leverett is inclined to correlate with it the till ridge known as Blue Island and the bowlder train which is traceable northward from the north end of this latter ridge in a belt about a mile wide. For 4 or 5 miles the bowlders are abundant upon the surface, at first several hundred to a square mile, but farther northward their number becomes so small as hardly to warrant more than a suggestion of such correlation. It is doubtless true, however, that the Blue Island till ridge was originally a broader and less abrupt swell than at present, extending farther north, east, and south. Unless this is to be correlated with the lake-border moraine system, it is probably that this was one of the larger undulations of drift of the ground moraine area. That the elevation is of drift and is not due to a rock core is shown by well borings. While the ridge has a relief of 25 to 50 feet above the surrounding plain the well at Morgan Park shows 76 feet of till over the rock. At Mount Greenwood Cemetery, on the west side of the ridge, the rock is reached at a depth of 94 feet, and at the Blue Island waterworks the depth of the rock is 69 feet. On the flat east of the ridge the Blue Island smelter well shows but 40 feet of drift over the limestone. The easternmost of the three till ridges as the north is intersected by the lake shore at Winnetka, and is not seen farther south. A bowlder tain on the lake bottom has been reported by Prof. Lyman Cooley, of the Chicago Drainage Commission, as running southeastward for several miles from the terminus of this east ridge, and Mr. Leverett thinks this may be a residue from a ridge of till which has been cut away by the lake. The general features of the unstratified drift have already been given. There is no essential difference between the drift of the moraine and that of the Chicago Plain except, perhaps, in the amount of leaching and oxidation which has taken place. This is markedly less on the plain. In the morainic tract the surface has been little modified since the withdrawal of the glacier, so that leaching has extended 5 to 10 feet below the surface, while on the plain but a few inches of the upper part of the clay fails to give a response to acid, which shows that [the lower material - EB] still contains the calcareous matter derived from the grinding up of limestones. On the moraine, oxidation of the iron-bearing elements in the drift has given to the upper 5 to 15 feet a light yellowish or buff tint, while on the plain the yellowish clay rarely extends more than 5 feet below the surface, and not infrequently excavations pass into the blue clay immediately below the surface. This blue clay forms the body of the till. At some places in its lower part it becomes very dense and is excavated with difficulty. As has been indicated, the microscope shows this clay-like matrix to consist in part of true aluminous clay and silt and in part of minute angular fragments of limestone. Besides these clayey and calcareous constituents there are quartz grains, bits of shale, and fragments of minerals of many kinds, such as would be derived from the erosion of crystalline rocks. In the bits of shale and also in its larger masses, especially in those obtained from the excavation of the first lake tunnel of the Chicago waterworks system [in 1867 -- EB], were found abundant minute globules believed to be plant spores. These masses of shale have been thought to be idential with the shale of later Devonian age, and, like the black shales of Ohio, they burn with a bright flame, giving out a strong odor of petroleum. A considerable amount of black shale has been noted in the drift about 2 miles south of Mokena in Will County. It is possible that this Devonian material in the drift was derived from local Devonian deposits, such as are represented by those at the Elmhurst quarry. But it seems probable, judging from the amount of erosion of the Niagara limestone, that these Devonian beds had, for the most part, been removed prior to the last advance of the ice. Black shales, however, occur at the top of the Hamilton beds of the Devonian at Milwaukee, Wis., as has been shown by test borings for the intake tunnel beneath the lake at that point, and doubtless elsewhere beneath the lake. The stratified sands and gravels so extensively present on the Chicago Plain are not here referred to. These are of lacustrine origin and were deposited at a later time under conditions which are discussed under the heading "Beaches of Lake Chicago." More or less local deposits of stratified material are of frequent occurrence in the drift, showing the work of waters from the melting ice. These deposits are usually of sand and gravel, stratified and cross bedded in a beautiful manner. Deposits of snad and gravel immediately over the rock surface beneath the bowlder clay are also frequently found. Almost every well sunk penetrates one or more such deposits, and in the country districts the water supply largely drawn from these reservoirs in the denser clay. In the Lake View water tunnel, just east of Graceland Cemetery, about 100 yards from shore, a large sand pocket was penetrated, having a length of 100 feet and a height of 20 feet. Much of the difficulty in projecting the various tunnels of the Chicago Water system on land and beneath the lake has been due to encountering pockets of sand, gravel, and quicksand. In the excavation of the drainage canal from Bridgeport to Lockport, a distance of 30 miles, much stratified drift was exposed. Some of this may have been deposited later by the lake waters discharging through the valley outlet, but much of it was undoubtedly deposited by glacial waters. From Bridgeport to Summit there is little besides till. Below Summit stratified deposits are frequent. Between Summit and the Chicago Terminal Transfer Railroad bridge were exposed fine sections of interlaminated sand, gravel, and clay, overlain by unstratified till. The delicately laminated beds were doubtless formed in ponded waters near the ice front, while at other points the strong cross bedding of coarse gravels indicates periods of vigorous flow, perhaps in times of greater melting. The overlying unstratified till may indicate a slight advance of the ice overriding the stratified beds. Considerable deposits of assorted gravels are also seen at various points in the sides of the valley. Perhaps the best exposure is on the north side of the valley a mile north of Willow Springs. Here are several large gravel pits. Well borings seem to indicate that the narrow hill east of Flag Creek in this vicinity is composed almost entirely of gravels below 12 to 15 feet of till. One-quarter of a mile southwest of Worth on the Wabash Railroad, are extensive gravel deposits at the pit of Henke and Reed. While the ice sheet was forming the Valparaiso moraine there were streams of water issuing from its front and escaping to [the] Illinois River Valley by the lower Desplaines, Dupage and Kankakee valleys. These streams became overburdened with material derived from the ice, and, in consequence, built up their beds and valley bottoms to a marked degree and spread out the detritus in extensive terraces. These deposits are principally of coarse gravels. Near Romeo, 3 miles southwest of Lemont, according to Mr. Leverett, the gravel filling in [the] Desplaines Valley reaches 620 feet above tide. This appears to be the head of this gravel, though by reason of erosion the precise location of the head is somewhat uncertain. The small eastern tributaries of [the] Desplaines River, Long Run, Spring Creek, and Hickory Creek, in the towns of Homer and New Lenox, WIll County, were lines of escape for the glacial waters over the front slope of the moraine. This discharge gave rise to the gravel deposits in these valleys, and these gravels are continuous with the more extensive deposits to the west, along [the] Desplaines Valley. A slight outwash from the inner crest of the morain also spread a thin stratum of gravel over much of the flat south and southeast of Tinley Park. As has been stated, it is generally impossible in this district to distinguish between the deposits of the last Michigan glacier and those formed by earlier advances of the ice. Undoubtedly the greater part of the exposed drift is the work of the last glacier. At various places, however, beneath the plain and the moraine a very dense, partially indurated till has been found. This is popularly known as hardpan, and is thought to be remnants of a drift sheet of earlier age. In discussing the wells throughout the Valparaiso morainal belt in Illinois, Mr. Leverett states that if ia well is carried to a depth much beyond 150 feet it usually passes out of the blue till into a hard brown till, unless rock is reached. He thinks that this hard till belongs to one of the earlier invasions of the ice. This hardpan was also encountered in the bottom of the excavation for the drainage canal a mile or so east of Summit. Here it was very hard and partially cemented. Its hardness, compared with that of the overlying till, was so marked that the contractors who were engaged to excavate this part of the channel were obliged to abandon the steam shovel which had been used in the soft till and resort to blasting. The shafts and borings for the various radiating land and lake tunnels of the Chicago city water system show the presence of this layer of brown hardpan overlying the rock surface, with a thickness varying from 10 to 40 feet. In the clay pit of the Purington, Kimball Brick Company at Purington station on the Chicago, Rock Island and Pacific Railway, 5 to 7 feet of hardpan was penetrated below 33 feet of blue till. It has here a sort of chocolate color, is stratified, and is very easily fusible. At some points buried soils have been penetrated by wells, but their occurrence seems to be rare, and little or no data have been obtained relating to them. This ends part 3 of The Chicago Folio by William Alden, 1902.